Welcome to the Watford Water Polo Club website. 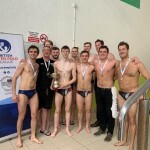 BWPL “Wally Rowse” Championship Two Trophy – Watford Water Polo 2017 & 2019 Champions.. Welcome home Banners in place at Woodside..
Nandi scores four v Sutton in Ref’s Cup Qtr-Final win- Photo credit to Trevor Hyde..
Head Coach Edi Brkovic hands out team instructions..
Watford Water Polo Club was established in 1901 and is based at Woodside Leisure Centre, Watford. The club originally met at the river in the lower part of Watford, near Bushey Arches. In 1932, we moved to the Watford Central Baths, which was the only municipal covered pool in the county until after the war. Watford now use three 25m pools, two 8 lane and one 6 lane. 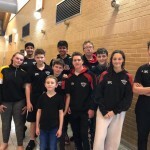 The club use Woodside Leisure Centre pool as a base, but as the club has expanded, other venues were introduced to accommodate the demand for more training and match play – QE Boys School in Barnet, and Habs Boys School in Elstree. 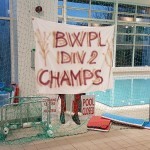 Until 2012 we were part of Watford Swimming Club, when we decided to go it alone as .Watford Water Polo Club. Today, the club attracts players from a wide area across Hertfordshire (including Watford, obviously) and North London and we are a thriving club with teams at all levels and age groups. 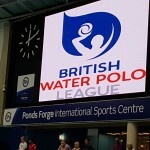 Our senior men’s team plays in the British Water Polo League, Division Three. The Men’s First Team plays in the London League Premier Division & Referee’s Cup, and our Men’s Second Team plays in LL Division One. We also compete in the Herts League Div One. 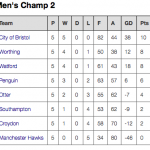 During the Winter months (Oct-March) our Men’s team competes in the Winter League Div One & our 2nd team is in Div Two. We have also have a very strong Junior set-up with an U18s team in the London League, two U16 teams (As & Bs) who play in the London League Division One and Two respectively, two U14 teams in the same division as each other, and an U12 team, also in the London League. 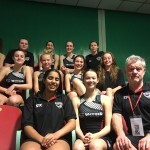 We have recently started a cadet scheme to bring on even younger players into the water polo world. 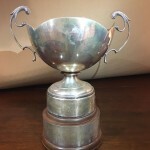 You can see our list of club league and cup honours in the club info section.